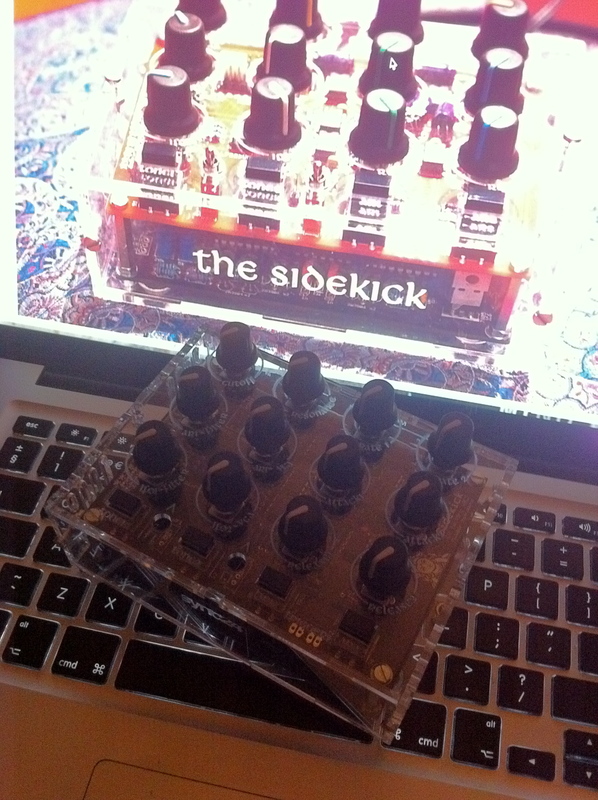 A recent thread on the muffwigglers Eurorack forum asked what members are up to with their MakeNoise DPO. 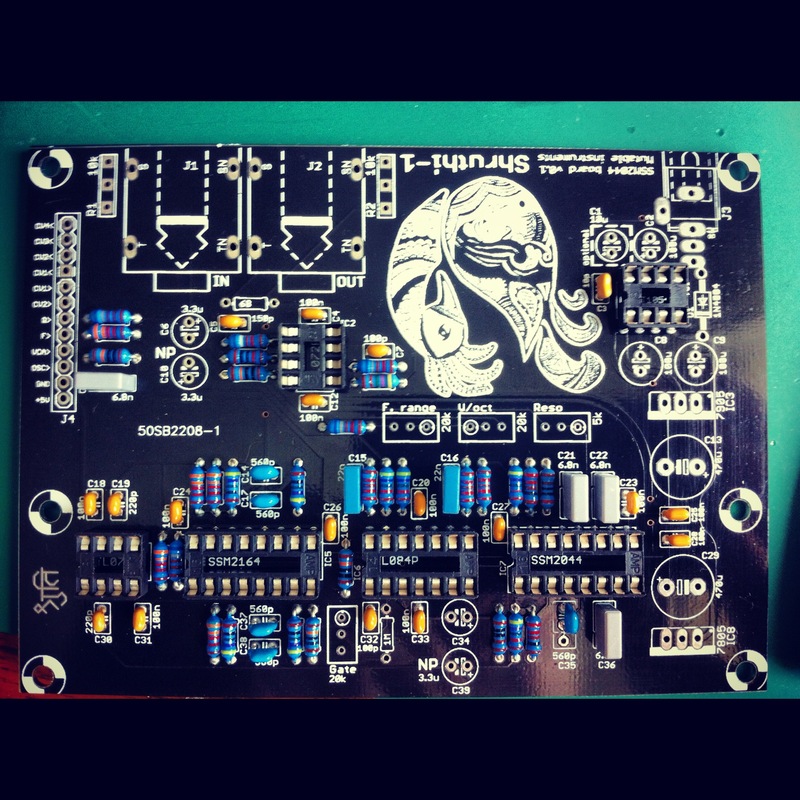 mutable instruments offer various filter boards to go along with the Shruthi-1 project. i grabbed one of the boards and ordered the parts in May 2011 and probably completed the control board in August or September 2011.
it has its own enclosure, like the Shruthi-1, but has no midi as it’s basically just a filter or tone generator / drone machine. once i’d completed the control board i tested it with the filter that came with the Shruthi-1, it worked, so i took a photo and moved on to the next thing. after ordering the GorF i thought i should get some older projects finished – the Sidekick being at the top of the list. 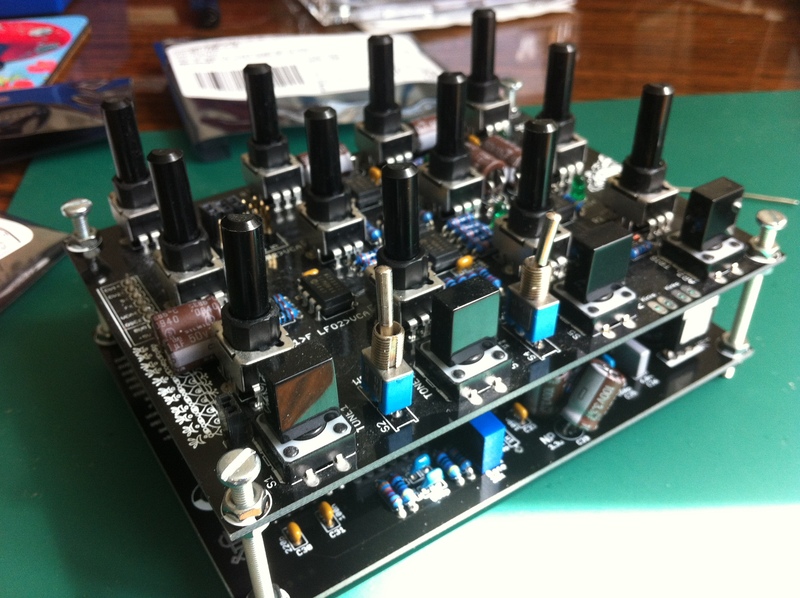 so i have just finished building the SSM2044 filter board (info here: http://mutable-instruments.net/shruthi1/build/ssm2044). maybe i need to spend more time with it until i find the good settings. ok, so i’ve finished the dronelab and done my first recording. i took a bit of time to get comfy with the beast, plugged in some effects and set the lappy recording. straight out into Audacity in the computer through the trusty mic socket. I have managed to get the Dronelab finished, finally! the last bits arrived from Mouser (dial caps and switches), then i realised i’d missed out on picking up a voltage reg cos it wasn’t in the parts list on caspertronics site…. so i got an expensive one from Craplin (Maplin). i was a little bit anxious about switching it on for the first time but needn’t have worried ‘cos this thing kicked into life and has been doing a top job since! overall i reckon it took about 5 or 6 hours, i think, to solder together, don’t know how long it took to source and organise all the parts though. i am mega-chuffed with it though and seriously think it is worth the effort, it can create a good range of sounds, more than i anticipated – together the Tremelo, Distortion and Band Pass Filter stuff makes all the difference (i guess without modding the thing). sounds range from solid thunderous drone to ticky & clicky rhythms. i will be doing some recordings and will post them asap. it's all about me building stuff, finding out about interesting things and recording as much as possible here. i'm making bits of music/noise, building bits of synths and stuff, making some images and exploring some software. i'm also reading about the history of electronic music and the future of music online.